You may have heard that you shouldn’t spend more than one-third of your income on rent. In fact, some leasing offices will even check your pay stubs to make sure you’re not overextending yourself before you sign that lease. In theory, this is a great idea. But this formula falls into the “easier said than done” category as rents continue to rise, with salaries struggling to keep up. Case in point: On average, an American household needs to earn at least $21.21 an hour to afford a modest, two-bedroom apartment without spending more than 30 percent of their income on rent, according to the National Low Income Housing Coalition (NLIHC). But because location so heavily influences rental rates, there are some extremes. 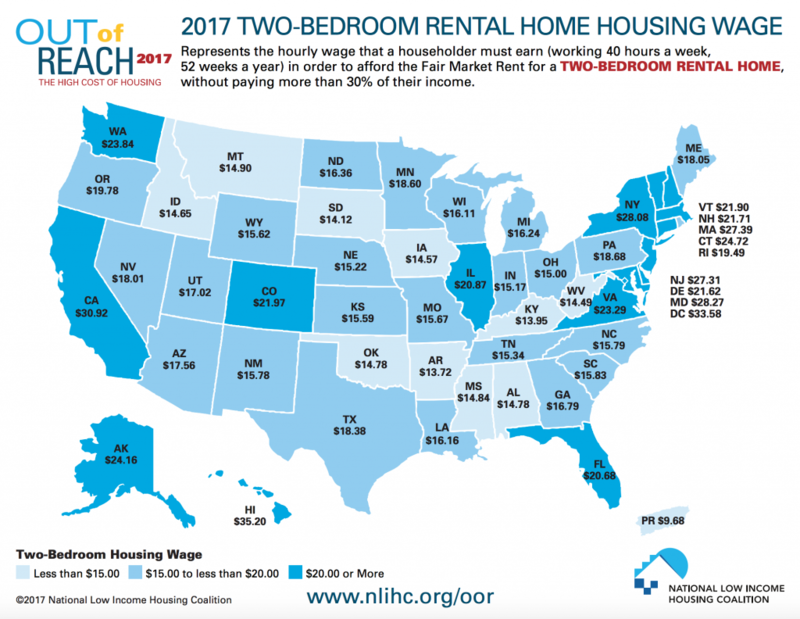 For example, you’d have to make almost $31 an hour in California to afford a two-bedroom rental, according to the map and study from the NLIHC that looked at rental rates in 2016. On the low end of the scale, you’d need to make $14.49 in West Virginia to afford a two-bedroom apartment. Here’s where things get tough. The federal government mandates a nation-wide minimum wage of $7.25 per hour. To afford a one-bedroom rental unit, when factoring in the 30 percent rule, a renter would need to earn at least $17.14 an hour. That means they’d need to work 94.5 hours per week. In addition, the rental market is tight. Thirty-six percent of U.S. households opted to rent in 2015—the largest share since the late 1960s, according to the most recent report from the Joint Center of Housing Studies at Harvard University. The demand for low-cost rentals far exceeds the supply that’s available. Harvard cites a study from the National Low Income Housing Coalition that showed there were only 31 affordable rental units available for every 100 extremely low-income renters. Here’s the hourly wage a household must earn in order to afford the “Fair Market Rent” for a two-bedroom rental unit without having to hand over more than 30 percent of their income. These numbers assume you work 40 hours a week, 52 weeks a year. You can also check out this map, which shows how many hours per week minimum-wage workers need to log in order to afford rent in a one-bedroom apartment. Some shockers? You’d have to work 124 hours per week in Hawaii, 106 in Maryland, 105 in New Jersey and 101 in New York. Where on the scale does your state stand?